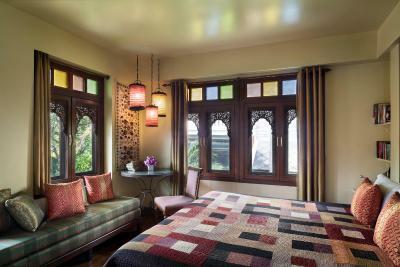 Lock in a great price for Chakrabongse Villas - rated 9.3 by recent guests. 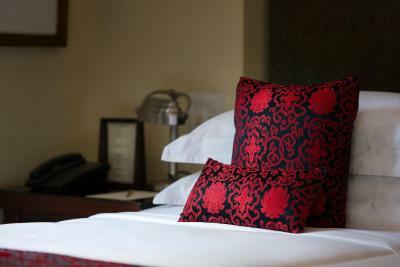 Beautiful, very spacious rooms in a gorgeous setting, very friendly and helpful staff, great location. Very special and private. 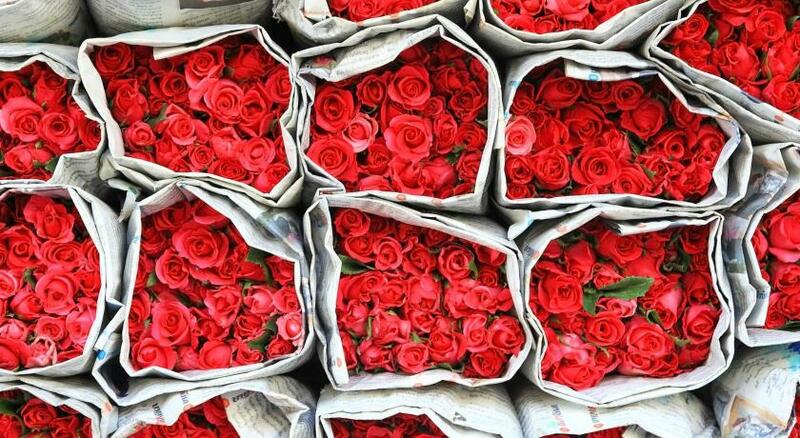 Nothing comparable. Excellent house, like a paradise in between the town. Very kind staff. Nothing to complain about. Breakfast had to preorder, but was very excellent. Except the croissant could have been better. It is a magical place to come into especially at night. 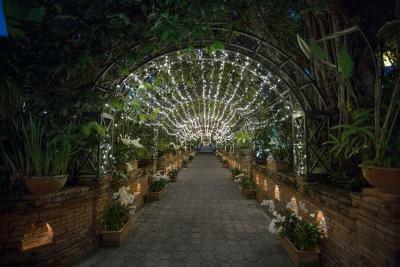 There is a wonderful, large garden with several water features and marvellous lights. It is a royal palace built for one of the king’s sons in 1908 and has security guards on a gated complex. 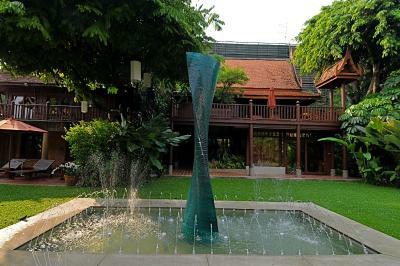 It is located five minutes from the flower market in one direction and ten minutes from the Grand Palace in the other – two of the top attractions of Bangkok. 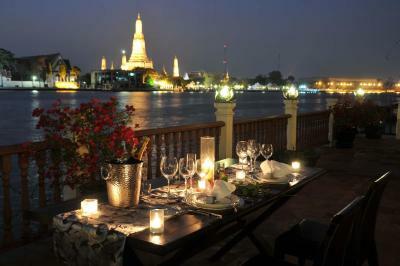 It is on the river and its chef accepted for a Michelin star. 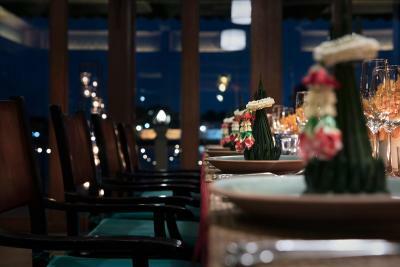 Breakfast or an evening meal on the river is wonderful. Absolutely marvellous, largish pool surrounded by lovely vegetation which we had mainly to ourselves. The staff are lovely – friendly and helpful. I don't understand how anyone gives it less than 10 out of ten. I travel a lot and this is one of the best hotels i have ever stayed at! Staff are beyond amazing, breakfast made for you on order, wonderfully presented and served on the terrace overlooking the river. Swimming pool is lovely and v private since the hotel only has few rooms. 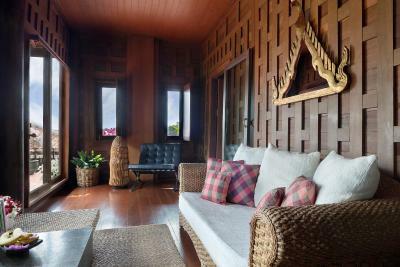 Do not miss the opportunity, stay at this property!! The location is excellent, the garden, the Pool. Just so relaxing and beatieful. 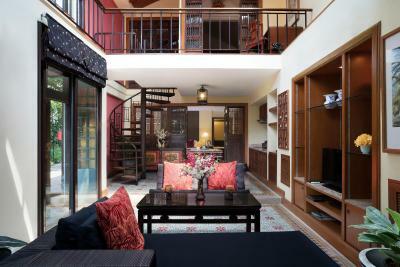 charming boutique hotel. personalized service. helpful and friendly staff. good location for sightseeing. 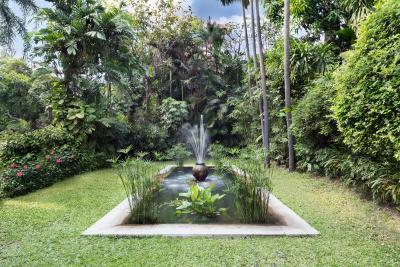 a rare oasis in bangkok within a royal residence. The location on the river is fabulous. The gardens are beautiful. Staff all lovely and helpful. The property has a sense of history, it is low key and "rustic". If you don't like to be exposed to the noises of a busy waterway and want all the modern comforts then this is not the place for you. The house is stunning - an old Thai House palace (no need to visit Jim Thompson House if you are staying here), the garden well kept and a true oasis and the salt water pool the best way to relax after a day of sightseeing! 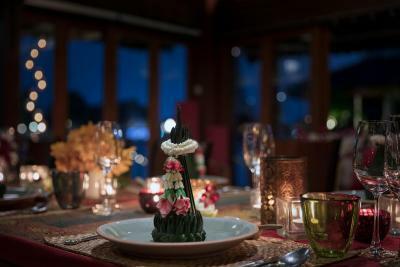 The home cooked food was one of the best we had in Bangkok! 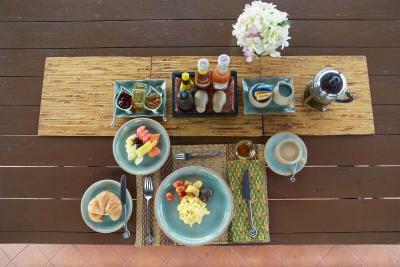 The Breakfast might be a bit small - but you`ll miss nothing! 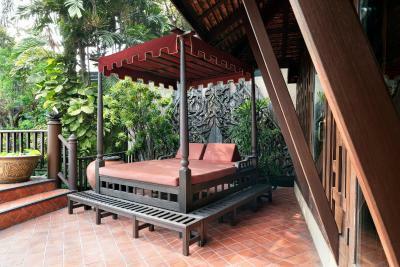 You couldn`t get a better location: right next to the Chao Praya and close to the main temples ! 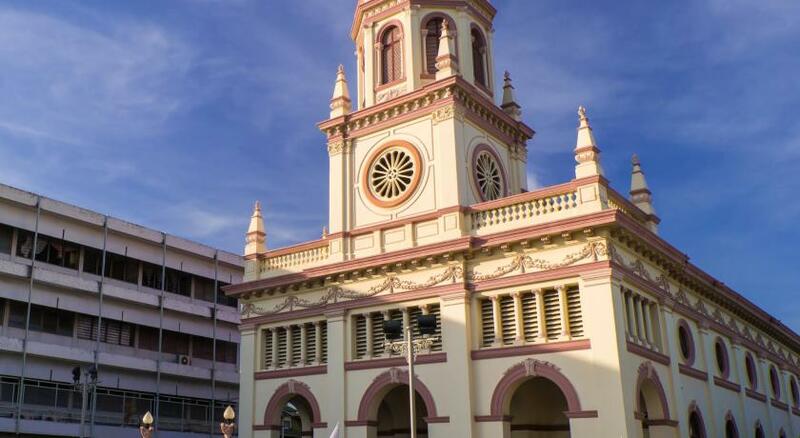 The managers are very friendly and welcoming -and full of ideas what to do and where to eat and drink in town - you don`t have to plan before you go, they have all the recomondations you need - off the beaten track . You` ll find yourself in authenic places without dozens of lonley planet readers ;-) , next time I come to Bangkok I wouldn`t stay anywhere elese! Exceptional experience and quality for the money. 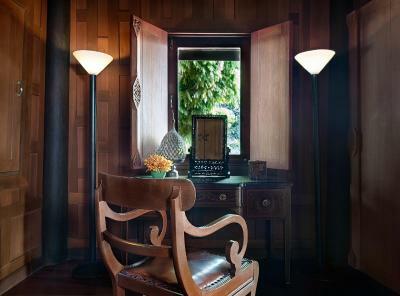 Right in the heart of Bangkok and on the river, the hotel is an oasis of calm and personal service. I'm only reluctant to praise it more as I'm worried that it will be booked up next time! There are several good local restaurants and cafes and yet the food at the hotel itself is tremendous and specially priced for guests. We loved the warmth of the staff Om and Atom. Both were so kind and generous vwirh their time, advice and enthusiasm. And we were even upgraded to the River Suite. 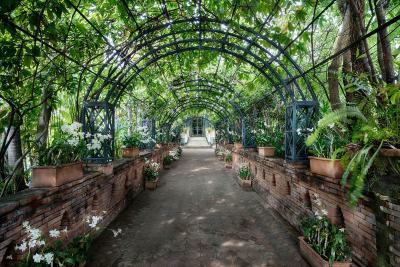 The location is outstanding , the gardens such a haven. One of our bestsellers in Bangkok! 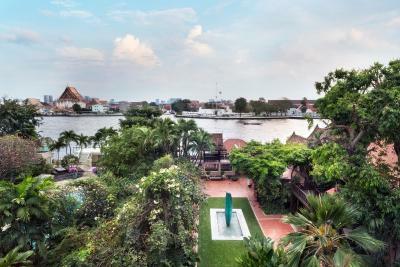 A former royal residence situated by the Chao Phraya River, Chakrabongse Villas offers stunning views of Wat Arun from luxurious Thai-style suites. 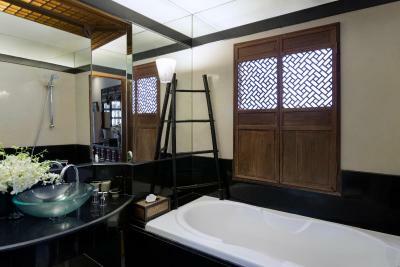 It features a landscape pool and attentive service. 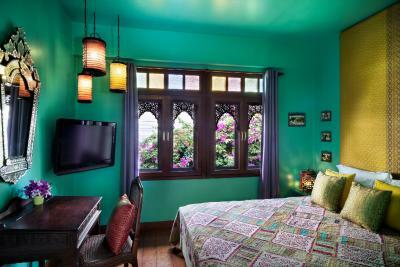 Located under 1.1 miles from the lively Khaosan, Chakrabongse Villas is a 15-minute walk from the Royal Palace and Temple of the Reclining Buddha. Suvarnabhumi Airport is about 17.4 miles from the hotel. 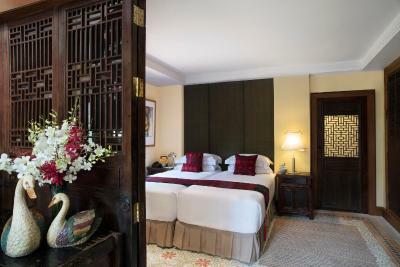 Featuring Oriental interiors with fine wood furnishings, spacious suites come with a cable TV and DVD player. 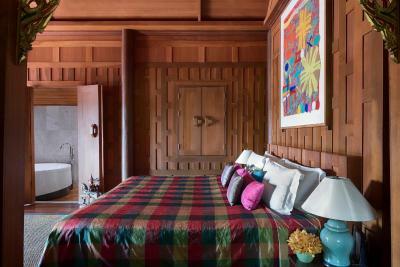 A minibar and private seating areas are provided. 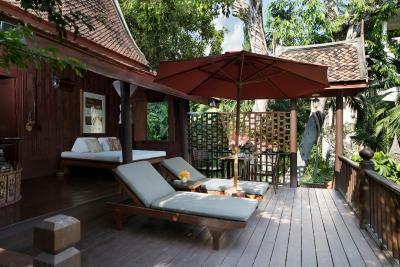 Guests can relax with a traditional Thai massage or rent a bicycle to explore the local areas. Day trips are easily arranged at the tour desk and a gift shop is available. 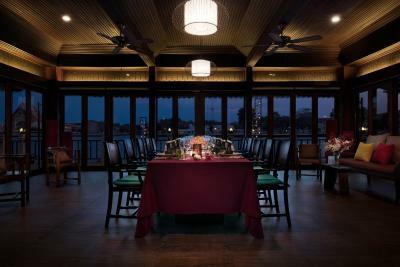 Offering Thai specialities, The Riverside Sala Dining Room features an outdoor dining pavilion lovely views of the Chao Phraya River. 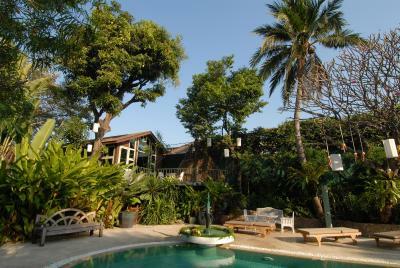 Chakrabongse Villas has been welcoming Booking.com guests since 24 Aug 2010. 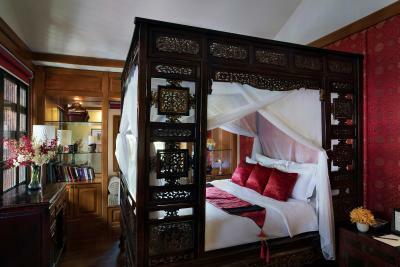 When would you like to stay at Chakrabongse Villas? 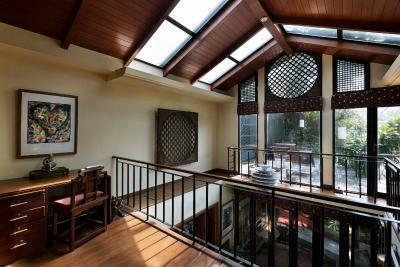 Features Chinese decor and includes living room and 2 private terraces. 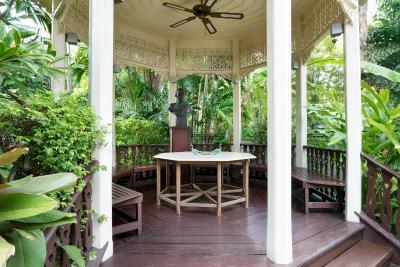 Features a kitchenette and private veranda with river view. 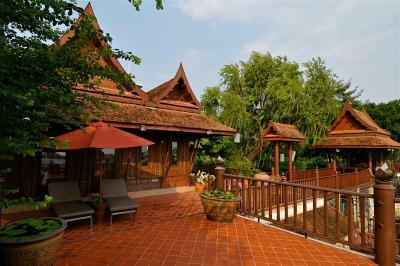 Features traditional Thai decor and includes large private veranda overlooking pool. 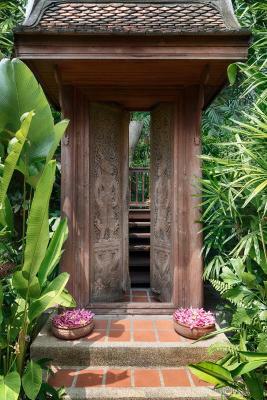 Surrounded by tropical garden, it features a private terrace and kitchenette. 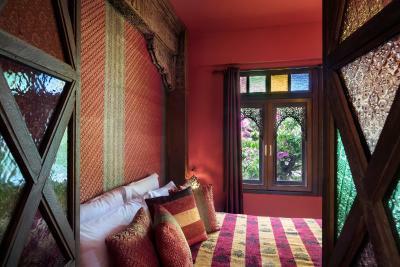 Room has Moroccan-style decor and is available for long stays. 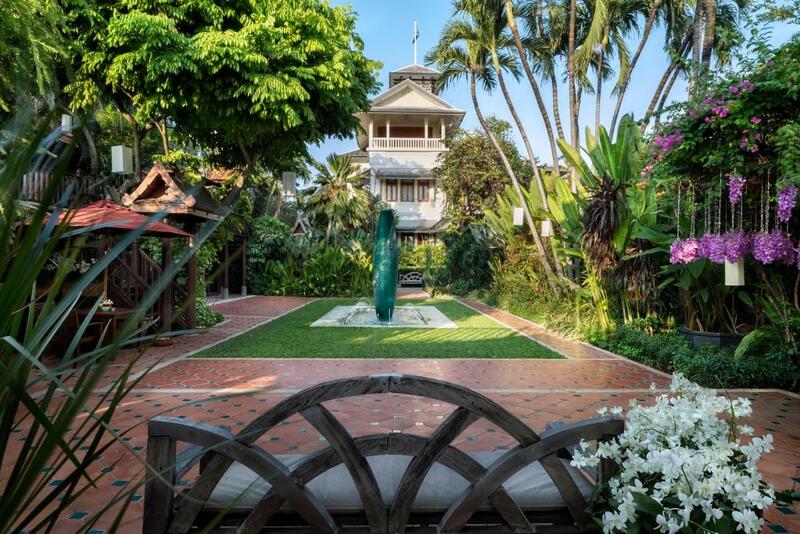 Set on the bank of the Chao Phraya River in the heart of Old Bangkok, Chakrabongse Villas provides a tranquil haven from the hustle and bustle of the modern city and yet is in easy reach of all the major tourist attractions. 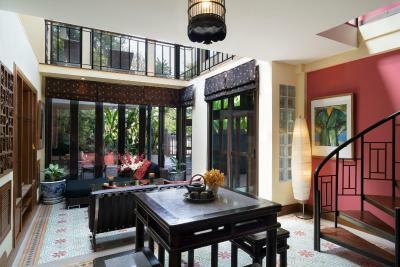 Four individual suites with all modern facilities are set in a lush tropical garden with a spacious swimming pool. 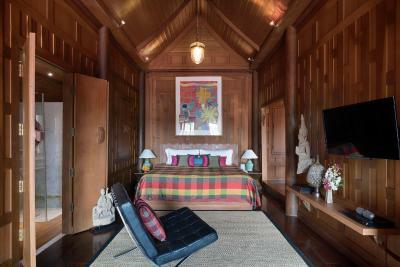 Built in 1908 by HRH Prince Chakrabongse, Chakrabongse House was originally used when he attended royal ceremonies in the Grand Palace and also for picnics and excursions on the river. Later, after the 1932 revolution, it became the residence of HRH Prince Chula Chakrabongse, writer and historian. 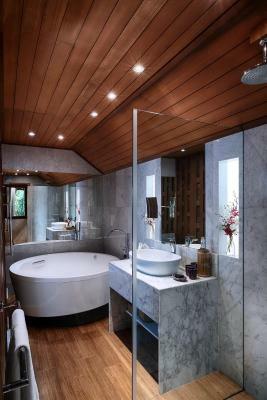 Today the grounds have been transformed into a magical boutique hotel by his daughter Narisa. 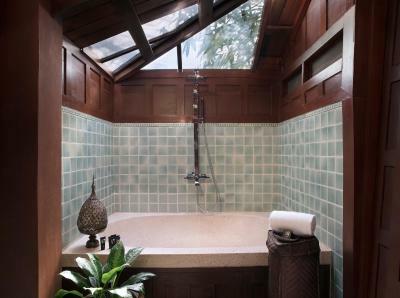 House rules Chakrabongse Villas takes special requests - add in the next step! 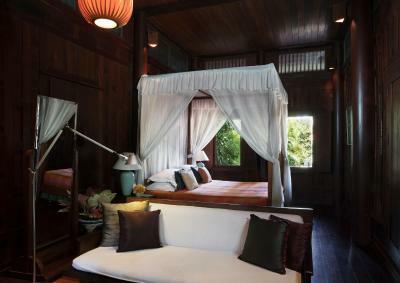 One child under 6 years is charged THB 1000 per night when using existing beds. All children under 12 years are charged THB 1685 per night for extra beds. All further older children or adults are charged THB 2247 per night for extra beds. Chakrabongse Villas accepts these cards and reserves the right to temporarily hold an amount prior to arrival. 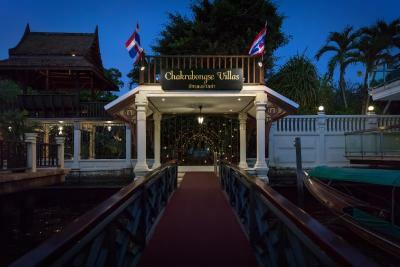 Loved this hotel, amazing rooms right on the river, very peaceful yet fantastically close to key sites and such friendly helpful staff. 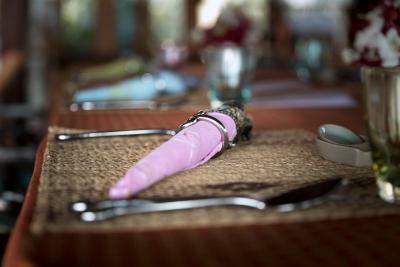 No 'normal' restaurant. Have to preorder. 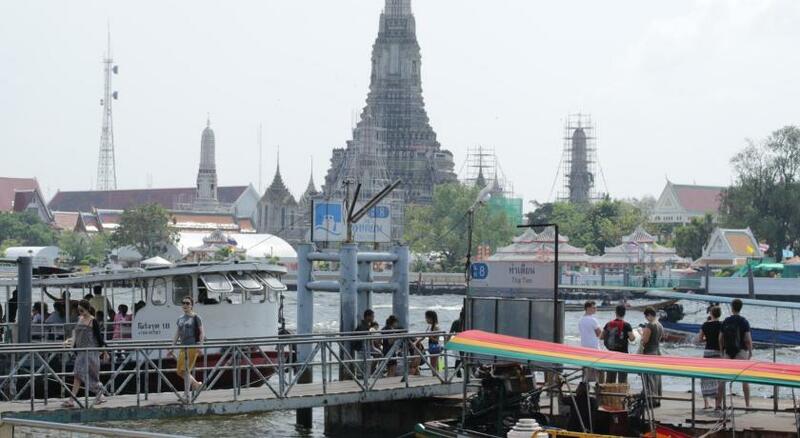 The outside area is typical tourist area with high prices and almost low food quality. Better eat 'street food'. Great location, service and ambiance! I enjoyed my stay thorowly. the thai royal set dinner a little bit disappointing. room a bit too romantic (too dark at nite even with all lights turned on). bathtub a bit difficult to get in/out for older couples. Seems quite churlish to criticize anything after such a wonderful stay, but the beds are a bit hard. This seems the norm in Thailand. Nothing else could reasonably be criticized. Sometimes, you don't have anybody to have a drink on the terrasse. And the room size was small. The view from the terrasse on the river.